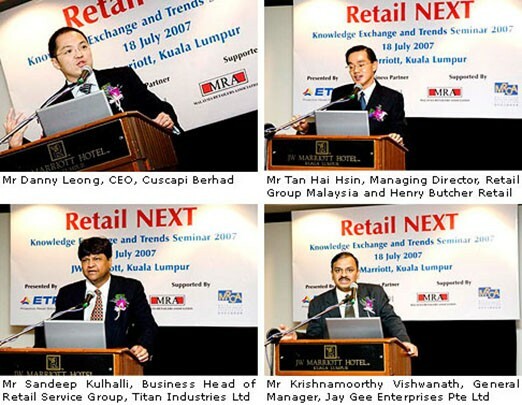 Kuala Lumpur, Wednesday (24 July, 2007) – ETP International Pte Ltd (ETP), an international retail solutions company, together with its business partner, Cuscapi Berhad, the leading business management solutions provider in Malaysia, jointly organised Retail NEXT, a knowledge sharing and market trends conference at the JW Marriott, Kuala Lumpur on 18 July, 2007. 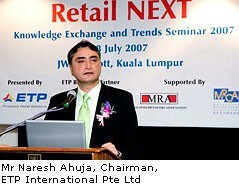 Partnering with ETP, an international software developer that focuses on the Retail Enterprise Software market in Asia Pacific, India and the Middle East, the first Retail NEXT conference in Malaysia showcased a series of presentations and expert opinions from top retailers and thought leaders from all over Asia Pacific on achieving business objectives and increasing brand value through proactive retailing. As a platform of knowledge exchange, the event was attended by renowned retailers from the region. Among the guest speakers for the event were Dato Dr. Chin See Keat, Chief Executive Officer & Managing Director of England Optical Group; Mr Phanthep Chatnarat, Chief Executive Officer of C-Mobile; Mr Tan Hai Hsin, Managing Director of Retail Group Malaysia and Henry Butcher Retail; Mr Sandeep Kulhalli, Business Head of Retailing Services Group – Titan Industries Ltd in India; and Mr Krishnamoorthy Vishwanath, General Manager – Jay Gee Enterprises Pte Ltd. The conference agenda covered a broad spectrum of trends and issues facing the retail industry. With over 70 delegates from leading retail companies in the region, topics such as managing retail branding, leveraging technology to increase business value in the retail industry and customer engagement were deliberated. The panel discussion which comprise of all the speakers started out with a lively discussion on the change in customers expectations. Delegates participated actively by raising questions on various concerns and even sharing their own experience with their peers. “This is a great opportunity for retailers to come together to share their experiences and successes with the objective of improving the retail industry here in Malaysia. Since starting this partnership with ETP in January 2007, we have seen tremendous interest from Malaysian retailers in how ETP V5 can improve their business. We believe that moving forward, Cuscapi, alongside ETP, will be able to contribute significantly to the Malaysian retail industry” said Mr. Danny Leong, Chief Executive Officer of Cuscapi Berhad. The conference closed with a gift presentation ceremony by Mr Ahuja and Mr Leong to all the speakers. Each delegate left the conference with the knowledge takeaways as well as an attractive door gift and conference proceedings from ETP International and Cuscapi Bhd. Established in 1978, we have grown to become a trusted and innovative industry specialist. Today, we have a stronger engine of exponential growth and sustainable performance. Now, we are ready, as Cuscapi, to take on the new challenges ahead of us. Our strong presence in over 20 countries in the Asia Pacific region and the US has given us the leverage to serve the diverse needs of clients across borders. As your business grows and expands into these markets, we will be there for you every step of the way. At Cuscapi, our organisation is built on three strong beliefs to empower your organisation to harness the true potential of your customers for success. We know that customers can be the most important asset for any enterprise. However, while most businesses may recognise the importance of customers, they have yet to tap into this undermined pool of resources. We know that customers can be transformed into an invaluable source of capital for your organisation. This is what we call customer capital. It is this belief that drives us to place your customers at the heart of all we do. We also believe in creating new value for all our clients. Beyond helping you enhance operational efficiencies, we always offer fresh insights and perspectives on your customers to create new revenue growth possibilities. In tandem with our belief to focus on delivery excellence, we strive to become more than a solutions provider to you. We want to be your strategic partner and offer you world-class solutions and services. At Cuscapi, we look forward to continuously enabling you through customer knowledge to maximise your customer capital. Share our beliefs and together we can take your organisation to greater heights by bringing you closer to your customers.